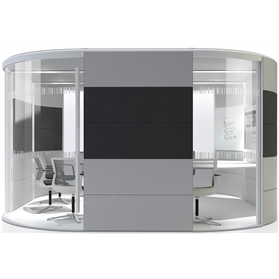 Launched in 2014, Orangebox’s award winning Air3 acoustic pod range is the most advanced room system yet providing free standing meeting rooms, private space, phone booth and touch down rooms.New materials, more finish options and a unique roof solution make this the most comprehensive pod system in the marketplace today. The aesthetic design of Air3 is a combination of high quality glass and soft acoustic panelling, creating a greater level of insulation and speech privacy. Interchangeable panels allow you to swap, change and refresh your colours and fabrics anytime, giving Air3 a unique and fresh look. An internationally patented opening roof system featuring an advanced fire safety system has been developed to cater for sprinklered office environments and buildings.Air3 has been designed as a global pod system solution — able to work all round the world, in UK / Europe , North and South America and Asia-Pacific.As with all Orangebox pods, Air3 is a moveable pod solution. This room system is demountable and therefore can be moved, re-positioned and fully re-used.There are 17 standard Air3 pods providing a variety of curved, square, small and large private meeting rooms. The Air-20 mini pod is a particular new addition specifically designed to provide high quality private space or phone booth for a single person who needs it for a few hours. PLEASE NOTE THAT IF YOU REQUIRE DIFFERENT COLOUR FABRICS FOR THE POD THERE IS AN ADDITIONAL COST PLEASE ENQUIRE. THERE ARE ALSO OTHER OPTIONS FOR FROSTED GLASS AND MANIFESTATIONS. PLEASE CONTACT US AND WE CAN ADVISE. FURNITURE, SCREEN, DIFFERENT COLOUR PANELS, WHITEBOARDS OPTIONAL EXTRAS PLEASE ENQUIRE.